The classic: this convenient 500 ml jar of Premium Raw Organic Virgin Coconut Oil is in popular demand. Its an essential part of any kitchen and bathroom. Naturally, you can use this nutrient-rich coconut fat for your daily, healthy diet; but it is also perfectly suitable for hair and skin care. Our flavorful multi-purpose Premium Raw Organic Virgin Coconut Oil with its many beneficial substances is cold-pressed and as harvest-fresh as it gets. Bursting with flavor, this Coconut Oil contains the best the coconut has to offer. Cloud No 9 is booked for you during a sensual massage with this subtly fragrant Coconut Oil. In harmony with nature and with respect for food Sun-ripened coconuts constitute the basis for our high-quality, all-natural Premium Raw Organic Virgin Coconut Oil. Our coconuts are freshly harvested daily by small-scale Philippine farmers and quickly brought to our production facilities. In addition to the top-quality of our raw materials, the gentle and immediate processing within a maximum of 72 hours after harvest contributes to the immense biological value of our organic virgin coconut oil with its pure and fresh taste of coconut. The coconuts are processed at 38 °C in first cold-press. The result is raw virgin coconut oil brimming with vital nutrients (vitamins, minerals, trace elements), with high levels of lauric acid. Scientific research has proven the positive impact these natural substances have on the body and the overall physical condition. In addition, coconut oil may support the absorption liposoluble vitamins and some minerals. You can taste and feel the positive impact of our coconut oil. Organic coconut oil impressively versatile and potent Our high-quality Premium Raw Organic Virgin Coconut Oil made from harvest-fresh, sun-ripened coconuts has an outstanding flavor as well as high levels of nutrients. However, it is also amazingly versatile in use. Due to its high biological value, it sustainably supports the overall well-being and good looks. You can use it to refine your dishes, to apply it on skin and hair and even for losing weight and conducting oil treatments. Or simply treat yourself to pleasant and relaxing massage with coconut oil to take a rest from your stressful day. If you use our coconut oil, youre doing yourself, your soul and the environment a favour. Our Raw Organic Virgin Coconut Oil is versatile in use: In the kitchen Our all-natural coconut oil in raw food quality is indispensable for cooking, baking and frying. It is rich in vital minerals and vitamins and offers a high lauric acid content of up to almost 60 %. Use it to refine soups, ice-cream, main courses and drinks and try it as an alternative sandwich spread or daily dietary supplement. It is also suitable for oil treatments, Ayurvedic oil pulling or as a boost to your diet. Beauty care You can seriously spoil your whole body with our harvest-fresh Premium Raw Organic Virgin Coconut Oil. It helps to regenerate your hair and provides it with a silky smooth appearance. As a facial treatment it will relax and rejuvenate your skin. Athletes use it to on their whole body to provide it with medium-chain saturated fatty acids. Used as a bath soak, body or massage oil it will give you a sensual treat. 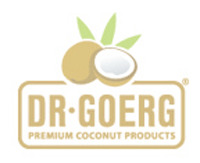 Dr. Goerg Premium Raw Organic Virgin Coconut Oil has a shelf life of up to two years. Please store the organic coconut oil closed at room temperature and avoid direct sunlight. Below 24 °C the oil solidifies without reducing the quality.